You are currently browsing the tag archive for the ‘Virtual Campus’ tag. CUNY SPS is proud to present this year’s ePortfolio Student Showcase, which highlights student work in individual courses, programs, and capstone projects at both the bachelors and masters level! ePortfolio provides a window into our students’ lives: who they are and who they aspire to be. While reviewing nominations to this year’s showcase, we saw a lot of CSS customization and multimedia integration; providing a richer experience for viewers while demonstrating students’ digital and communication skills. Showcase winners received an Amazon gift card and a digital badge to place in their ePortfolio. Feel free to browse the showcase website or visit the featured ePortfolios directly below. To visit the ePortfolio directly, simply click on a student’s name. To view additional information such as the course they created the ePortfolio for and why the ePortfolio was featured, click on the image. Congratulations to this year’s winners! If you’re interested in submitting your ePortfolio for next year’s showcase click here. Meet the ePortfolio Showcase Winners! 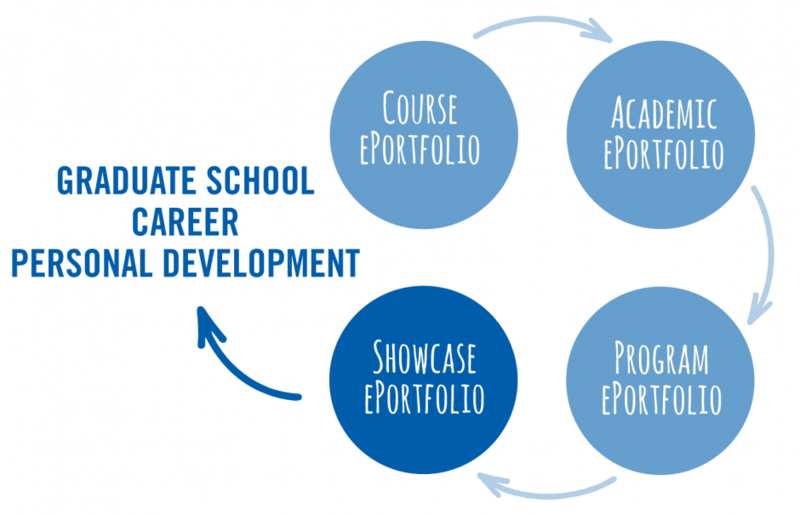 The ePortfolio Showcase, which is hosted on a Digication ePortfolio site, highlights student work in individual courses, programs, and capstone projects at both the bachelors and masters level. ePortfolio provides a window into our students’ lives: who they are and who they aspire to be. While reviewing nominations to this year’s showcase, we were delighted to see much more multimedia integration; providing a richer experience for viewers while demonstrating students’ digital skills. Showcase winners received an Amazon gift card and a digital badge to place in their ePortfolio. Please take some time to browse the featured ePortfolios below and feel free to leave the winners some comments on their work. Both Joan Murray and Donna Harbans really dove into reflection. They included full reflections for each course listed in their academic sections as well as an overall program reflection. Benjamin Miller delivers presentation and passion in his Business ePortfolio. He included a great deal of video presentations and documents to support his business ideas. Tobie Buford and Xian Edwards showed the many ways students can use multimedia to express themselves and compliment their course work. Both put a lot of work into their ePortfolios having shared much about themselves and their studies. Tobie used SoundCloud to make us hear the passion she has for disability studies. 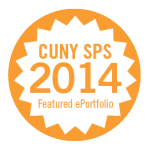 We’re thrilled to be able to share their work within and beyond the CUNY SPS community and send a special thank you to all of the showcase winners for the time and energy they put into their ePortfolios – they really are fantastic! Submit Your ePortfolio to the Student Showcase! Have you created one or more ePortfolios this past year? If so, we invite you to submit your ePortfolio to the CUNY School of Professional Studies ePortfolio Student Showcase for an opportunity to be selected as one of the “Featured Student ePortfolios” on the ePortfolio Showcase website and receive a $100 Amazon gift card! To nominate yourself, please complete this form by May 24, 2014. Please help us recognize your great work with ePortfolio! Think hard about the organization, appearance and general layout of your ePortfolio. Be sure all relevant documents are uploaded to their corresponding sections of the ePortfolio. Avoid bright colors and stick to the more traditional business formatting and fonts. Use meaningful pictures to bring some life to your ePortfolio. Write good content and keep it up-to-date. Use reflection to create a narrative of your transferable skills. Connect your ePortfolio with social media sites so people can find you more easily. Now that the fall semester has begun, some students have reported issues accessing content in their Blackboard course site and have reached out to the Help Desk to ask which browser is best for use with Blackboard. Firefox is SPS’s preferred browser; however, the most recent release of Firefox may impact your viewing of YouTube videos and other media from within Blackboard and Digication. If you have trouble viewing embedded media from within Blackboard or Digication, look for a small shield icon to the left of the web address in Firefox or to the right in Chrome. Click on the shield and follow the prompts to unblock the missing media. View videos for detailed instructions for allowing blocked content in Firefox or Chrome. To access all of SPS’s Help Desk videos click here. ePortfolio Student Showcase Now Live! SPS is delighted to present our 2012/2013 ePortfolio Student Showcase! The showcase, which is hosted on an SPS ePortfolio site, highlights student work in individual courses, programs, and capstone projects at both the bachelors and masters level. Thanks to all of the instructors who nominated students for inclusion in the showcase and to the ePortfolio Team for encouraging students to self-nominate. This year we were able to provide $100 Amazon gift cards to students whose ePortfolios were selected for inclusion in the showcase and digital badges to display within their ePortfolios. If you’re interested in submitting your ePortfolio for an opportunity to be selected as one of the “Featured Studies ePortfolios,” you still have plenty of time to do so – the nomination deadline for next year’s showcase is May 24, 2014. Recently I read an FB status on a friend’s page that asked what a panic attack felt like and I smiled in sympathy. I wanted to reply and describe it, but I didn’t want to take up that much space. I recently experienced my first panic attack. A: “Yes, and I needed some advice from someone on what to do about it and S. wanted me to call you.” Here I think she said something else, but I couldn’t really hear her anymore. Somewhere in the middle of that last sentence is when the panic set in and the attack began. My hand was shaking so hard I could hardly hold the phone. My heart felt like it would beat out of my chest, or be squeezed to a complete stop by the increasing tightness. My throat was closing up and I realized there were tears falling because I felt them scalding my face. Both my son T. and his dad J., my significant other, were staring at me with panicked looks on their faces. I hung up the phone and ran past them to the bathroom. J. followed me in and shut the door. “S. had a baby girl!” I squeaked. I grabbed his shirt tightly with both hands and burst into loud crying. If he hadn’t been holding me so tightly I think I might have crashed to the floor, I could hardly breathe. He let me cry for a while and when I finally began to wind down, he said, “You have a right to feel upset and cry, but you need to get it together and call those kids back. Can you imagine how scared they are right now? And they called you for help. Go call her back, and go get the baby if you need to, everything will be fine.” He was right of course and hearing him say it, I started to feel much better and calm down. I washed my face and then as he walked out of the bathroom, my mother knocked on the door. He let her in and directed her to the bathroom. As soon as I saw her, I burst into tears again, having an ‘I-need-my-mommy-moment.’ And although that lasted all of about 90 seconds, it helped me get an immediate perspective on how it must feel to be a seventeen year old girl with an issue like this and no one to talk to. I told my mom what was going on and she said essentially the same thing J. had. I just felt all the hurt, anger, and disappointment drain out of me to be replaced by something like a steely resolve. I went back to the kitchen (and my wine!) and called A. back and arranged to pick them and the baby up the next morning. She was with us for a few weeks until her parents got themselves situated. Now I am officially a grandmother to a beautiful baby girl named Charlie. Whew, I said it! I guess I’ll be writing lots of infant articles now, between her and my niece. I can’t wait to pick her up and meet up with my sister and niece to shop for baby girl dresses, shoes, hair bows and pink everything! Cheryl is a student at CUNY School of Professional Studies and the mother of three boys. A former office manager, she currently writes a blog about her adventures in parenting called UrbanMommys.com. In her spare time she likes to check out fun new places and things to do with children for her readers. In September, SPS announced that Linda Key (’12) received a prestigious Fulbright award. Applied Theatre students and alumni continue to break ground. At elementary schools in all five boroughs, Leah Page (’13), Liz Parker (’11), Rachel Evans (’13), Amy Sawyers (’13), Anneka Fagundes (’11), Shamilia McBean (’13), Brisa Munoz (’13), and Sara Hunter Orr (’13) deliver “Alice’s Story,” an interactive theatre piece about bullying. The piece was created by J’nelle Chelune (’11), Ria Cooper (’11), and Anneka Fagundes for the arts in education organization Making Books Sing, with the organization’s Director of Education. 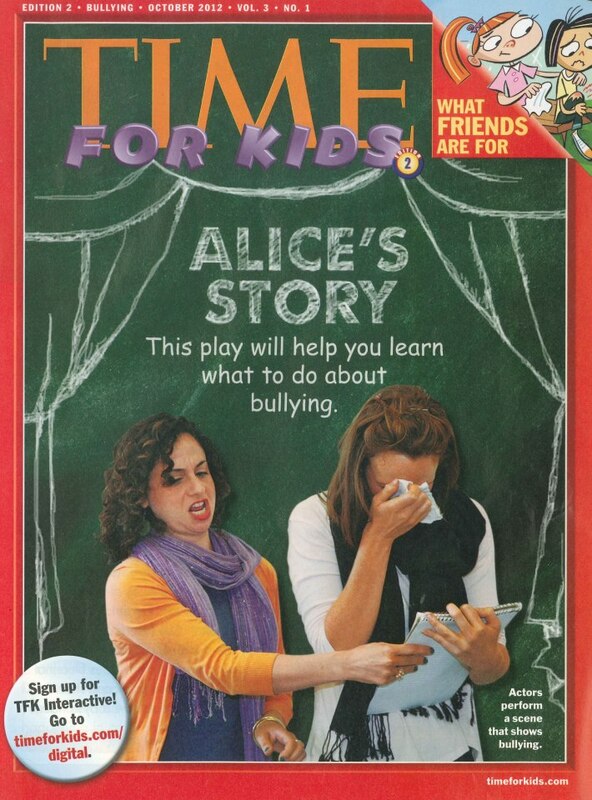 TIME for Kids magazine covered “Alice’s Story” in a recent October issue—in fact, the publication featured Rachel Evans and Liz Parker on its cover, in TIME’s iconic red frame. In Chelsea this summer, second- and third-year students interviewed seniors at SAGE, the nation’s first Lesbian, Gay, Bisexual, and Transgender senior center. Led by visiting professor Tony Goode, our students wove the interviews into an original piece of theatre, and then performed the piece for SAGE and other centers. Chelsea Now covered the performance, acknowledging Carli Gaugh (’13), who had “channeled a SAGE member” and captured the spirit of the singular seniors. The Applied Theatre program’s collaboration with SAGE began in 2011 as a thesis project. Sherry Teitelbaum (’11), Kevin Ray (’11), and Jenny Houseal (’11) led LGTBQ youth and members of SAGE in creating a theatre ensemble. Foreshadowing this summer’s work, the ensemble drew on its members’ stories to create a dynamic original piece of theatre. Now, the project, called Bridging the Gap, has won major funding to return to SAGE; Bridging the Gap’s second original piece, “The Quest for Love,” premiered Saturday, December 1 at The LGBTQ Center. Also working with seniors, Abigail Unger (’12) was recently hired as Recreation Coordinator for Project Find, a network of senior centers throughout the city. Downtown at Judson Memorial Church, Wil Fisher (’11) and Michael Wilson (’11) produced The New Masculinities Festival, an evening of performances addressing what it means to be a man. See www.manquestion.org/festival or to watch the performance. Much of this week we have been reaching out and hearing back. The stories of lives disrupted make it impossible to deny the enormous impact of the storm, even as it feels impossible to reckon fully with that impact. But we have also been reminded of how we are bound together as a community of mutual support, how feelings of isolation or disconnection are temporary as we pull back together and return to our shared work and purpose. We acknowledge that some of you have suffered grievous losses, and we are deeply sorry. If there is anything we can do to help, please let us know. Please feel free to email me directly at John.Mogulescu@sps.cuny.edu with your concerns, suggestions or needs. We have been making (and will continue to make) adjustments that should make it easier for us all to get through what remains of this semester. And we are confident that, however bad things may seem now, we will get through this. Already, the impressive resilience of the SPS community justifies that confidence. John Mogulescu is the Senior University Dean for Academic Affairs and the Dean of the CUNY School of Professional Studies, and his responsibilities involve him in many different aspects of the University’s academic life. In addition to SPS, Dean Mogulescu has overseen collaborative programs between CUNY and the NYC Public Schools, CUNY Prep Transitional High School, the CUNY Language Immersion Program, CUNY Start, and the Adult Literacy and GED Preparation Programs. Dean Mogulescu also supervises the University’s Workforce Development Initiative, special training initiatives for City and State workers, and programs for welfare recipients, in addition to Adult and Continuing Education at CUNY and its non-credit programs, which serve over 250,000 students per year.